It all started with a post on the Star-Board forum about sailors having difficulty getting their new Starboard F161 formula boards over the 30 knot mark. 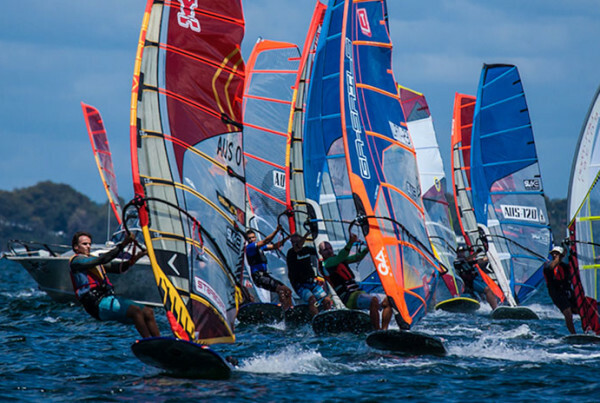 From there, sailors from around the world reignited their interest in achieving the fastest speed on the gps-speedsurfing formula rankings. Being present at the beach where Dennis Littel posted his record of 34.04 knots (peak) we discovered some new ideas on tuning formula kit for high downwind speeds and also how this knowledge could be applied on the race course to improve your downwind speed. The fastest angle appears to be around 120 degrees. FW boards can obviously run much deeper angles than that (up to 150 degrees) but you generally travel slower when heading very deep. When you do head deeper than 120 degrees, your apparent wind decreases appreciably (almost below your board speed) which counteracts the ability to travel faster – as your board cannot go faster than your apparent wind. FW boards are wide and have a lot of wetted surface area. The main aim in improving your downwind speed is reducing your wetted surface area. This is usually done by railing the board with your feet (and stance on the board), but selecting the correct fin can make railing even easier downwind. To go fast at 120 degrees, you require a decent sized FW fin of no less than 66cm. Shorter fins (especially now that the tail width on most modern formula boards is +82cm) will make the board unstable and most likely give you spin-out problems. To go faster downwind, you usually would take a bigger sail out on the racecourse. Most people understand this as the increase in power with a larger sail is the sole cause of the increase in downwind speed. A larger sail (and more power) helps considerably to rail the board downwind which also results in downwind speed increase. The faster you go, the more drag you have and power you need, so to help reduce the drag – use a sail that helps you rail the board downwind and reduce the board’s drag. Generally speaking, FW speed records will be most likely set in +25 knot winds so most sailors will be already down on their smaller rigs. It is my opinion that 9m sails will be difficult to achieve speeds over 30 knots with and those who have achieved this feat would have been faster on 10m sails. A 10m/11m sail will generate the required power to help rail the board, provided the fin is compatible and also working with the overall tuning of the equipment. This is by far the fastest way to travel downwind. By “flying the fin” you are railing the board so excessively that at times there is only a small portion of the leeward rail in the water. Have a look at this fantastic photo of Danish sailor Jesper Vesterstrom (DEN-111) taken by John Carter in England. Jesper is using an 11.8m sail and 70cm fin in 15-18 knots of wind in this photo and he is able to comfortably rail the board to reduce the drag it produces through the water. This is achieved mostly by pointing your toes and using your front foot to pull up on the strap to iniate the railing. A tighter back strap will help with this also, however most FW sailors run a slightly looser back footstrap to allow their foot to step in closer to the middle of the board and not so far out onto the rail. It is important to have a stance on the board that keeps the sail upright and allows the sail to breath so as to keep control of the board as it goes through the chop on the rail. Believe it or not, small chop helps your FW speed by increases the board’s ability to rail downwind. On a speed strip, with ultra flat water it is more difficult to rail the board and keep it railed. Dennis Littel commented after his famous day that his fastest runs were in the small 20-40cm chop away from the smooth bank he had been running along. The board would be easier railed, which allowed the sailor to concentrate on his stance and sheeting, to keep the board trimmed and fluent through the water. The closer the chop is together, the more this will help. 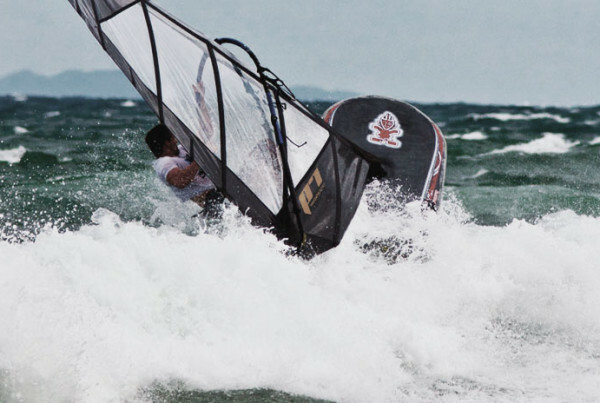 In strong winds this may be a dangerous combination for some – but you have already signed your life away by wanting to get a FW board over 30 knots !! Here is a link to Dennis Littel’s famous record breaking run and also my run on the same day at the same location. My setup was: Starboard F161, Gaastra Vapor 10m, R13 66cm M. Dennis used F2 FX-V, MauiSails TR-3 11m, R13 68cm. Unfortunately, I did not sail enough runs that day to get my average up over 30 knots, although my top speed was over 32 knots. Both of us were running our “racing” setup and did not modify the trim in any way for the speed runs. In fact, that gear was capable of doing <49 degree angles upwind at 15 knots boardspeed with VMG’s of over 10 knots. The fastest sailors downwind on the race course can usually translate that ability to being fast on the speed course. It is a combination of equipment, technique and conditions however I believe the first two play a far more important role on an FW board than on a speed needle. Hopefully this article spurs more people on to brave the craziness that is high-speed FW sailing! Next PostSave your back … rig it right. Great article. What speeds were Steve and Jesper hitting in the recent Oceanics? I agree with what you are saying, particularly on the angle – deeper than 120 certainly kills the speed but in racing I guess we get used to heading as deep as we can…. I presume chicken strap is a big no-no from a speed point of view? @ Steve GBR135 – thanks! Unfortunately, we didn’t get a lot of GPS data from the top guys during the event (or myself for that matter). We got really unlucky over the week with the gps units Jesper Vesterstrom and Jesper Orth not recording tracks even though the unit was on (you know how you can somehow turn the gps recording off if you take the unit indoors accidently?!). What a bummer! About the only clean tracks we got of Steve Allen and myself over the week were on the last day which was in 10-12 knots – obviously not incredible speeds in such low wind. Both Steve and Jesper V run very deep angles downwind; deeper than myself – so I would imagine they are not doing crazily fast speeds (ie, not over 30 knots but certainly fast enough to win races) however their angles would surely be up to 150 degrees downwind. We had very large seas running at the Oceanics so I imagine it would’ve been difficult to get over 30 knots with a 2-3m steep swell running! But high 20’s were definitely achievable I’m sure. The chicken strap is an interesting one. I for one don’t like to use it at all for racing unless it’s psycho windy, however Steve Allen really likes the chicken and I notice he uses it occasionally in winds where others are in the outside strap. I remember on the older Fanatic FW boards (03/04/05), Steve talked about the board being so easy to rail downwind that you could use the chicken even in 15 knots and it was very fast and could allow for really deep angles. So I think in the "racing" sense, there’s still opportunity to use the chicken strap successfully and still be fast. In a "speed" sense I would think its a no-no, because you are really trying to load the fin and rail the board and I don’t feel you can get consistent enough rail pressure in the chicken strap when you are not running such deep angles; also it might feel a little uncomfortable if you are only running at 120 degrees instead of 140-150 like you would in racing conditions. Do you think the pro’s would ever get interested in trying to set the FW record on GPS-Speedsurfing ??? Seeing as it’s not an "official" record as such and does require (as all speedsailing seems to) a bit of patience and time devotion to waiting for the right conditions at the right place, I would imagine it’s not financially feasible for many to go and do this. The other point is, from what I’ve seen, not many of the top guy’s own or know how to operate a GPS unit unless they are into speedsailing! That being said, Dennis Littel has won races at international level, so I would consider him a ‘pro’ even if he doesn’t windsurf full-time. I’m sure more people will get interested in FW speed but in the mean time it might just be the lesser-pro’s of the sport. Wow, that is fast. Any chance we could see Dennis’ raw gps track from that run?? @ speeder – I haven’t got the track from Dennis from that particular day, only from a few days earlier in that week when it wasn’t so windy. I’ll try to hit him up about it and see if I can get the track and put it up for download on this page. Is there some kind of secret to being able to sail a 10/11m in 25 kts? I can ‘handle’ my 10m up to 20kts (barely) but anything above that is impossible. Just the other day I rigged up my 11m just as the wind picked up to about 20-22kts…I was not even able to leave the beach!!! The force in the sail was so strong it just flattened me and I was not able to sheet in at all. Any secrets you could share? What kind of sail / board / fin combo are you using? I think sailing FW in high winds is about 50% strength, 25% technique and 25% gear. Often you will see the top sailors out on 11m sails in +25 knots. They are using very good fins which allow them to keep the board in control in such strong winds. 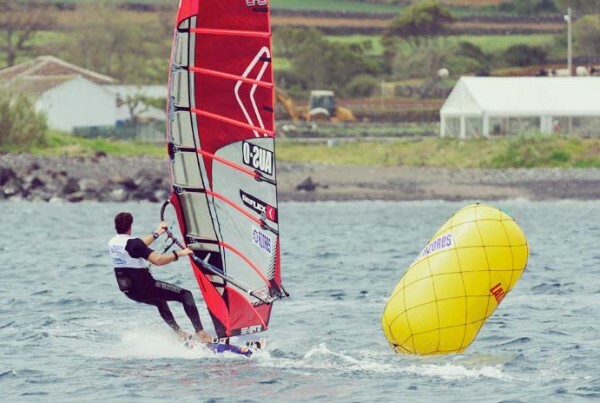 There’s also the factor that using a bigger sail with a wider boom length sometimes actually HELPS keep the board flat on the water with the extra weight (however it does make tacks/gybes considerably more difficult). Time on the water is the other thing. If you were to go and rig your 11m and sail it in +20 knots 3-days a week for a few months you’d have no trouble with it anymore! Strength is something everyone forgets to put in the occasion. I use quite a big sail in strong winds for my size currently (I’m 78kg / 185cm). When I was 18 I couldn’t hold on to my 11m in much over 20 knots even though I was 78kg back then also. When I got to 20-21 I had done a few years in the gym and improved my strength immensely (however I was still the same weight/height) and suddenly it was much easier to hang on to big sails. The gear tuning is all about control. Mast track right forward, harness lines a touch longer. Some people put their booms lower but I actually think this doesn’t help as you don’t get as much leverage against the fin with your bodyweight with a low boom so you can’t push against the fin when the gust hits you and you get lifted. Sounds like there are no tricks to it then…just hard work. If I was able to ‘get going’ in 20+ on my 11m then I could see that maybe my fin (stock Drake 19 btw) is lifting too much or whatever but the weird thing is that in those winds…when I am standing at the beach I literally cannot sheet the sail in enough to get forward momentum. It just slams down on me or catapults me. I weigh about 75kg and probably just need to develop a bit more muscle as you suggested. Actually if the sail is slamming you down then it is more likely how you are rigging it that is the problem. What sail are you using and mast, and then how are you rigging it? To the specs on the sail, or extra downhaul etc etc? The Stock Drake fin won’t be as friendly as a handmade custom fin at the top of the wind range, but you should still be able to get out on the water with it. I assume you are using a Starboard board then? – what model? I’ve been rigging it ‘to spec’ but will try a bit more downhaul next time. I have found that when I increase the downhaul to the point where the sail is actually really smooth, then the top is very loose (like a windvane) and it may actually rattle when going upwind. I don’t know maybe I will try to get hold of a different mast or play around with some tip/bottom extensions to see what happens.